There are two wood workshops. You can learn lots of different skills. 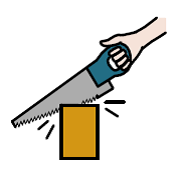 How to use tools like saws and chisels. Some people learn how to use big machinery too. Members of the workshop make lots of different things, like, tables, wooden toys, stools, picture frames and even musical instruments. Some of the things that get made get sold in our shop – the Mulberry Bush at 77 Morningside Road, or at our Christmas Bazaar.